The Olympic 2012 starts on Friday, so let's check out the coveted gold medals. This year's Olympic gold medal weighs about 410g and contains only 6 g of gold or, about 1.34% of its weight. But the doubling in prices of gold and silver since the 2008 Games in Beijing ensure that the medals are the most expensive in Olympic history. 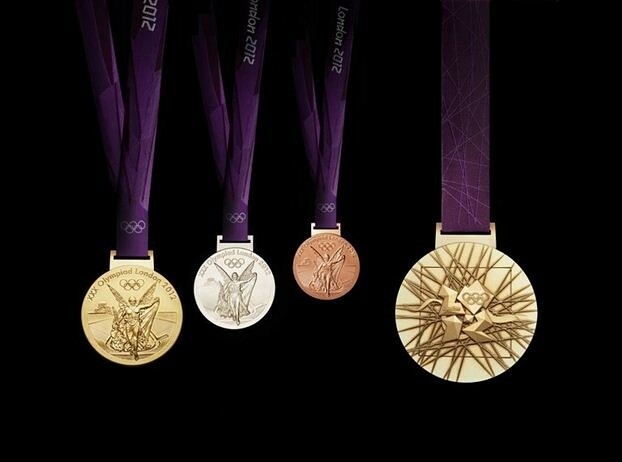 The gold medal consists of 1.34% gold, 92.5% silver and 6.16% copper. The gold, silver and copper, mined by global mining giant Rio Tinto in Mongolia and the United States are now kept in tight security at the Tower of London. The eight tonnes haul arrive at the tower on July 2. Beijing 2088 gold medal weighs 200 g. As heavy as your typical Blackberry set. By today's silver and gold prices, the Gold Medal cost about RM2,000. But the actual net worth is priceless. Lee Ching Wei bawak balik kaler apa agak nya ya..
Hopes this will motivate our Malaysian athletes to bring back more medal especially the gold one. Malaysia Boleh! Our no.1 shuttler, Lee, is now assured of at least a silver medal. If he beat Lin Dan in the final, he will bring Malaysia's first ever Olympic gold medal.